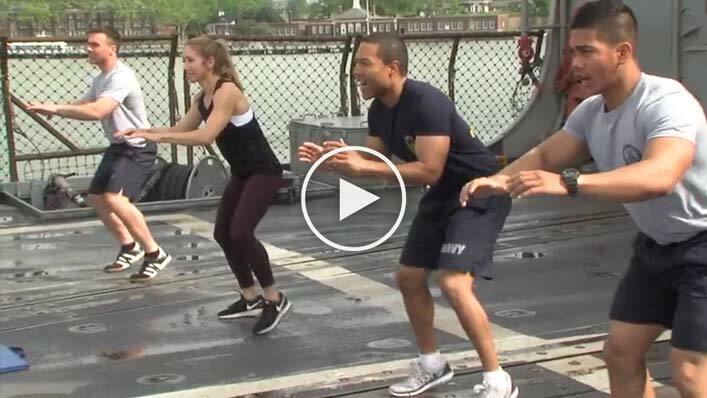 Lindsay Berra trains with the sailors of the Ticonderoga-class cruiser USS San Jacinto during Fleet Week 2017 for SportsonEarth.com (video will open in a new window). Lindsay Berra discusses her grandfather Yogi Berra's Presidential Medal of Freedom and the Yogi Berra Museum roast of Michael Kay on YES Network's The Michael Kay Show. Lindsay Berra discusses the passing of her grandfather Yogi Berra's best friend, Joe Garagiola, on Fox's Good Day New York. Lindsay Berra remembers her grandfather Yogi Berra and discusses his legacy on NBC Sports Final with Bruce Beck. Lindsay Berra discusses the Yogi Berra Museum and Learning Center and the love letters her grandfather, Yogi Berra, wrote to his wife, Carmen, on News 12 New Jersey. Lindsay Berra participates in rappelling practice for Stamford's "Heights and Lights" Christmas Show with Yankees GM Brian Cashman and sportscaster Duke Castiglione on Fox's Good Day New York. Lindsay Berra discusses her grandfather Yogi Berra's legacy and the Yogi Berra Museum and Learning Center on One-on-One with Steve Adubato. Lindsay Berra discusses the petition to get her grandfather Yogi Berra the Presidential Medal of Freedom on Fox and Friends. Lindsay Berra discusses her grandfather Yogi Berra's Presidential Medal of Freedom on Fox and Friends.